Born and bred in the beautiful Malaysia, Irwin Ang is an avid nature lover, especially the colourful and mystical underwater world. Since picking up the diving sport in 2011, Irwin was promoted to a diving coach few years later. 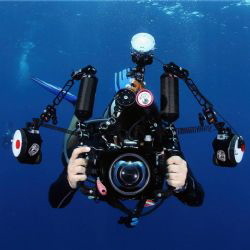 Today, he has attained the status of a world-class award-winning underwater photographer. Irwin is here to share his thoughts, rich experiences and the techniques with you. Sink in to Irwin's motto: Explore, Create, Share... and learn the tricks of capturing the most memorable underwater moments.